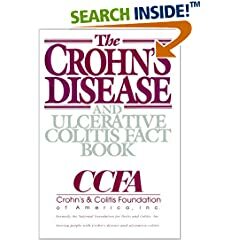 I found that books about Chrones Disease a great help to me when I was first diagnosed, some really helped and some left me with more questions than answers! That is why I thought it's would be a good Idea to create a post about some of the books that are available and then possibly in the future write a sort of Chrones Disease Book review. Taken from the back cover: "Crohn's disease nearly took my life and dream of running in the Olympics. This book is helping me control my disease and stay in training." --Rene Felton, Track and Field National Record Holder"
France and Germany: The Chrones Disease and Ulcerative Colitis Fact Book is also available from any of the AbeBooks links above.